I loved the inspiration piece they chose for the CASE Study challenge this week. Click on the photo to check it out. I decided to use snowflakes instead of leaves. I had planned on a very simple once layer card like the one provided to CASE but my brain just couldn’t stop trying to come up with my own spin on it; a way to make it my own. 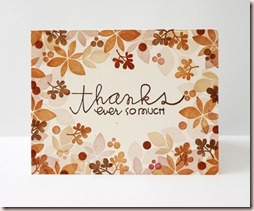 So I thought of die cutting a hole and adding the sentiment to acetate using white Staz-On ink. But honestly, I HATE using white Staz-On. It is messy and hard to clean off of stamps and blocks. It has to be re-inked every time you use it and doesn’t even always give a great impression. I guess I could have carefully heat embossed it but I didn’t think of that until I am typing right at this moment! 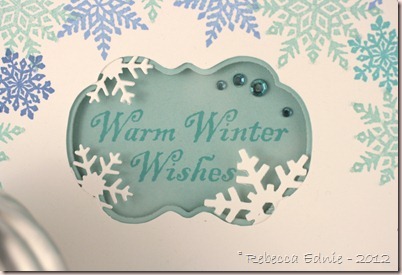 So I left the acetate alone and just used it to support the snowflakes I inserted into the opening then stamped the sentiment on the inside of the card. I got this all done and even photographed it then decided it needed more bling. So I added glitter to the aqua snowflakes and rhinestones to the sentiment area. Shame you really can’t see the glitter at all. It is white so it can’t be helped. I’m entering this into the Caring Hearts Card Drive. I have to hurry and get it and my other card in the mail. I’m sure they would love it if you could help out! Ink: hawaiian shores, aqua mist, blueberry sky-PTI, bashful blue-SU! How beautiful, Rebecca! I love the effect with the partial snowflakes in the window! Lovely! Thanks for playing along with us this week at CASE Study! I love the cut out! Fab card! thanks for joining us at CASE Study!